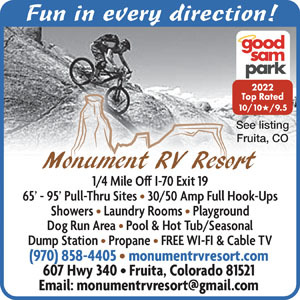 Monument RV Resort offers a variety of accommodations to fit every need from 95' pull thru sites with full hookups to tent sites and cabins. Located 1/4 mile south of I-70, Exit 19. Closest park to Colorado National Monument. This park has a lot of long-term trailers that most are in a very poor state of repair and while they are located at the back of the property, when walking around the park for exercise it was very disconcerning they allowed dogs to be chained outside with no oversight staff was OK but didn't pay attention to detail. We have 40,+ coach and our spot up front was very nice in width, length and clean. Not on our repeat list. 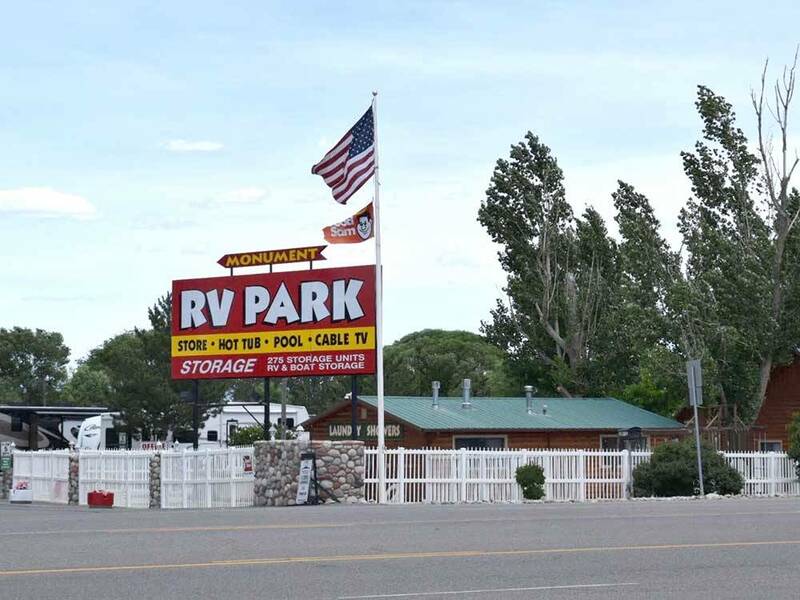 Incredibly wonderful RV Park. Very clean, well maintained, and employees that treat you like family. Hot showers, clean bathrooms, and a spacious Laundry room with an ironing board?! You have got to be kidding - no, this place is the real deal! Make no mistake, you will not regret choosing this amazing park in such a beautiful location. P.S. The gated dog run was the highlight of the trip for our fur babies :) fresh grass, a few large rocks, and even a stump to pee on. A real 5-Paw experience! It might be a bit small for a very large dog, but was perfectly huge for our 5 chihuahuas. Great place. Easy to find. Clean and well maintained. Friendly and helpful staff. Amazing restrooms. Level sites. We stayed one night passing thru. The campground was clean and had some trees. The office people were pleasant and helpful. There appeared to be quite a few long termers but still quiet not run down. There are several double hook up sites which means trailers enter the sites from opposite directions so doors can be facing each other. Our pull-thru site was on the end of a row which was nice but the odd utility set up meant our electric cord was stretched to the max in one direction and sewer to the max the other, but it worked. There are a lot of beautiful parks nearby, so, if we had time, this would have been a very acceptable base camp. After a long day on the road we were happy to be here. The Park is under new ownership. We have upgraded the WIFI system, added a security system, upgraded our reservation computers, added 2 more 95 pull thru sites and are working to have everyone have a pleasant stay.